This show was broadcast on January 19, 2010. Will be archived here after the broadcast by Tuesday evening. 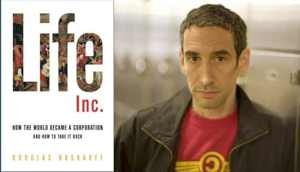 Tuesday–Live Interview with the author of Life, Inc.
Email your questions or comments now. NYU professor Douglas Rushkoff, author of the new Life, Inc.., as well as Coercion: Why We Listen to What “They” Say (which I applied to 9/11 truth here, eliciting the compliment “terrific stuff” from Professor Rushkoff, whose take on 9/11 seems to have gone back and forth a bit…) Whatever his current views may be, Douglas Rushkoff has written more good, popular books than any other American professor I’ve yet heard of. His new Life, Inc.: How the World Became a Corporation is a provocative critique of the corporatocracy from a historical perspective. It includes a chapter deconstructing the central banking currency system, and looks at broader cultural and spiritual issues surrounding corporate culture. See Kevin’s radio show blog here. Deadline for emailed questions is 6am Pacific Time, Tuesday. Not all emailed questions will be answered on the air. 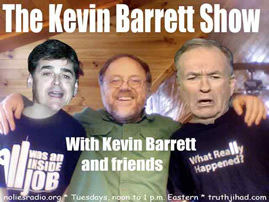 The Kevin Barrett Shoiw is independently produced and hosted by Kevin Barrett and these shows are externally produced content. All externally produced content broadcast on No Lies Radio is the sole responsibility of the program-content producer and is not the responsibility of NoLiesRadio.org. Any questions or concerns should be directed to the content producer. This entry was posted on Wednesday, January 20th, 2010 at 9:11 am	and is filed under Anti-War, Freedom, Justice, Kevin Barrett, News, Protest. You can follow any responses to this entry through the RSS 2.0 feed.